Now that summer is upon us, it seemed fitting to pull out a lighter recipe to go with the pleasant weather. The salad roll, known by other names as a summer roll or Gỏi cuốn, is a traditional Vietnamese appetizer and snack (no it’s not Chinese). While this humble wrap goes by many different names around the world (and even within Vietnam the name changes by region) the premise remains the same. 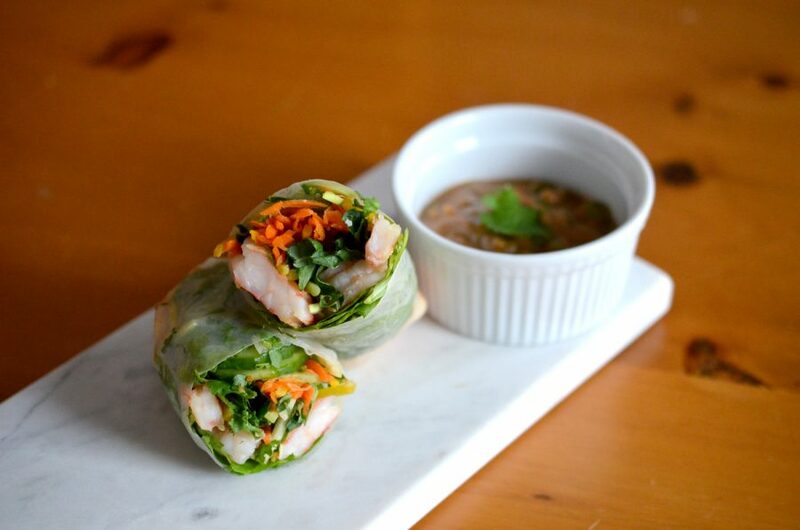 Wrap some crunchy fresh greens with protein in rice paper to create a simple and interesting appetizer or main course for all types of gatherings (or even if you want dinner and lunch for a few days). Fun fact, salad rolls are listed as number 30 of the World’s 50 most delicious foods compiled by CNN Go in 2011 and I’d have to agree. Plus as an added bonus, salad rolls taste great with peanut sauce (for those of you who are big fans of Vietnamese food like I am). Fear not though, peanut sauce shouldn’t be a deal breaker. If you have the unfortunate affliction of a peanut allergy, salad rolls are also great with good ol’ Hoisin sauce and chili hot sauce (like Sriracha)! *You can find these in your local grocery store (they look like this). In a small bowl, combine all of the ingredients for the peanut sauce. Set aside. Set out the fillings in bowls in front of you so it is easy to reach. You will need to work quickly once the rice paper wrapper is wet. Place them around a cutting board you can work on to build your salad rolls. Fill a large flat dish with boiling water so that the water is 2-inches deep. Place the rice paper wrapper in the water, or rotate it in the water, until all parts are submerged. Keep submerged for 5-10 sec then remove and place on the cutting board. Layer a small amount of each of your fillings in the shape of a log in the center of the wrapper, leaving space all around the edge. Work quickly as the wrapper will get very sticky very quickly. Once your salad roll is filled, roll one side of the wrapper over the filling. Fold in the two edges and roll the log towards the final uncovered end until it is all stuck together (think of it like making an Asian inspired mini burrito!). Try and keep your rolls as tight as you can wrap them without ripping the wrapper to help it keep the roll together as you eat it. Set the completed salad roll aside and repeat with remaining ingredients until all of your filling is used up. Serve immediately with the peanut sauce you made earlier.